According to a source at the Tennessee Wildlife Resources Agency (TWRA), the Mississippi Flyway Council met in late August where they voted on and submitted recommendations to USFWS regarding frameworks for the 2017-18 hunting seasons and bag limits, based on this year’s population and harvest data. The recommendations also included a request for operational status of Tennessee’s Sandhill Crane hunting season (now entering its fourth year “experimental” season). The Service Regulation Committee considers the Flyways recommendations and will publish a set of proposed frameworks in the Federal Register. At that time, the USFWS will accept public comment on the proposed frameworks. Shortly after the comment period, they will make any necessary adjustments to the frameworks and then finalize them. These become the overall set of “rules” under which each state can establish their hunting seasons. The deadline for your comments to TWRA is November 15, 2016. “The Tennessee Wildlife Resources Agency is soliciting comments for its 2017-18 waterfowl and other migratory bird hunting regulations, including sandhill cranes. This is an opportunity for the public to provide ideas and share concerns about hunting regulations with TWRA staff. The comment period is open Oct. 15-Nov. 15, 2016. Due to recent changes in the timing of the federal regulation process, waterfowl and other migratory game bird hunting seasons are now proposed to the Tennessee Fish and Wildlife Commission at its January meeting and voted upon at its February meeting. Additional information: The number of permits issued for 2017-2018 TN hunting season remains the same as the 2015-2016 season, 400 permits – 3 cranes per permit. However, the 2016-2017 season has been extended from 28 days to 53 days. The hunt zone also remains in southeastern Tennessee – South of Interstate 40 and east of State Highway 56. Hiwassee Wildlife Refuge is within this zone. The hunt will be stopped only for the weekend of the annual Sandhill Crane Festival. With the issuance of the new rules there is the distinct possibility that the hunt will be extended statewide, with an increase in both the number of permits issued and the number of cranes allowed to be killed. This year, approximately 4,500 individuals attended the 4th annual Wheeler NWR Festival of the Cranes, in Decatur, Alabama the weekend of January 9th – 10th, 2016. For many, however, the most exciting part of the weekend was getting to observe 5 Whooping Cranes that stayed within sight of the refuge observation building the entire weekend. It was a great festival so mark your calendars for next year! Whooping Cranes UL #1-11 and DAR #59-13, “Latka” walk over to join the other Whoopers. Wheeler National Wildlife Refuge, located along the Tennessee River between Huntsville and Decatur, was established in 1938 to provide habitat for wintering and migrating birds. Considered the easternmost Refuge in the Mississippi flyway, this 35,000-acre Refuge attracts thousands of wintering waterfowl each year. The Refuge is made up of a wide diversity of habitat types such as bottomland hardwoods, wetlands, pine uplands, agricultural fields, and backwater embayments. This varied habitat provides excellent feeding, loafing, and roosting sites for waterfowl, as well as nesting sites for migrating songbirds. In January of 2006, two Whoopers from one of the Operation Migration cohorts were discovered on Wheeler NWR. Since then, Whooping Cranes have wintered there each year. During the winter of 2012-2013, up to 12 Whoopers spent a portion of their winter on the refuge. In recent years, they have frequented areas around the visitor center and wildlife observation building, allowing thousands of refuge visitors the opportunity to view them and learn their amazing story. The International Crane Foundation (ICF) works to protect Whooping Cranes from threats like fresh water shortages, wetland destruction, power line collisions, illegal shootings, and more. According to ICF’s Lizzie Condon, Keeping Whooping Cranes Safe Coordinator, last winter, a total of 36 whooping cranes were spotted in Alabama before the birds began their northward migration in March and April. This year she hopes the total will be more than 40. Simply by attending the Wheeler NWR Festival of the Cranes, an individual helps protect Whooping Cranes by showing their support for the cranes in the north Alabama region. Who were those Whoopers attending the Festival? During this year’s festival five Whooping Cranes, among thousands of Sandhill Cranes, were visible at any given time from the wildlife observation building. Refuge staff are able to identify the individual Whoopers by the color-coded bands on both legs – color combinations unique to each crane. Ultralight-led migration: Captive-born chicks learned the migration route following Operation Migration’s ultralight planes. Sadly, the just ended 2015-16 migration was the last for this program. Direct Autumn Release (DAR) program: In the fall, captive-born chicks are released on Horicon National Wildlife Refuge in the company of older cranes from whom the young birds will hopefully learn the migration route. Parent-reared (PR) program: Captive-born chicks are each released near a wild crane pair in hopes the pair will “adopt” the chick and lead it on migration. This part of the Whooping Crane reintroduction program began in 2013. To learn more about Whooping Cranes, join in protecting them, and take the “I Give a Whoop” pledge please visit www.savingcranes.org. The International Crane Foundation submitted comments to the United States Attorney scheduled to hear the case of the accused shooter of two Endangered Whooping Cranes killed on January 11, 2016 in Beaumont, Texas (click here to read ICF’s full statement). The accused shooter, Trey Joseph Frederick, was arraigned on Monday, January 25, 2016 and pleaded not guilty to the charges of shooting and killing the two endangered Whooping Cranes. Representatives of the International Crane Foundation were in court attendance and asked that Frederick be prosecuted to the fullest extent to deter future perpetrators of shooting crimes. Two federally endangered Whooping Cranes were found dead in a rural area about 18 miles west of Beaumont, Jefferson County, Texas on January 11, 2016. Federal game officials arrested 18-year-old Trey Joseph Frederick after witnesses reported having seen Frederick in the area with a hunting rifle claiming to have been hunting geese. Federal agents contacted Frederick at his home where he admitted to killing the cranes. Whooping Cranes are migratory birds and are protected under the Migratory Bird Treaty Act making it unlawful to capture, kill, or attempt to capture or kill these birds anywhere in the United States. Frederick was charged on January 14 with illegally shooting and killing the cranes. If convicted of the Migratory Bird Treaty Act violation, he could be sentenced to up to six months in federal prison and fined as much as $15,000. 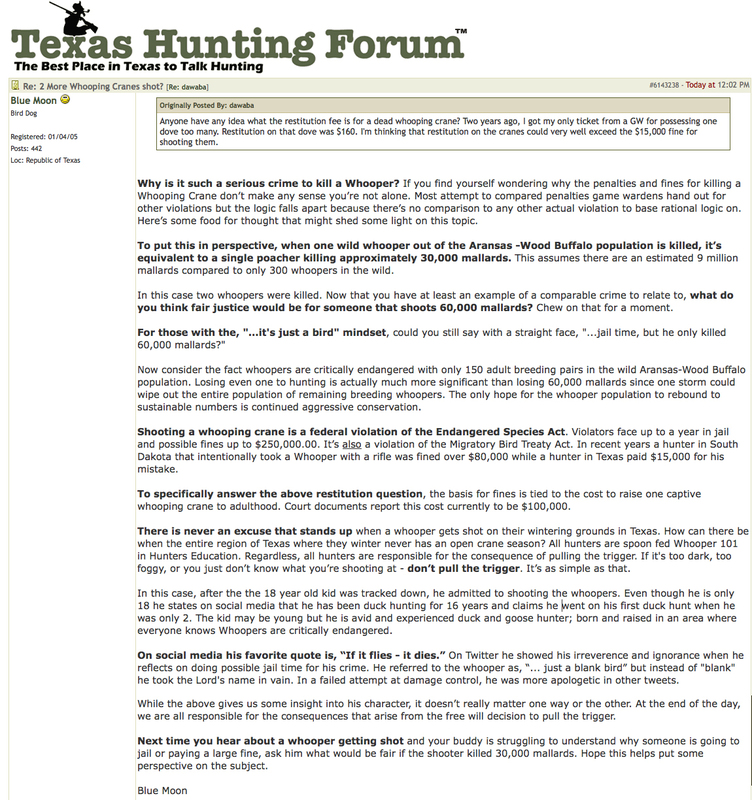 – Hunter comment on the Texas Hunting Forum, read more here. Although originally released in Louisiana at the White Lake Wetlands Conservation Area (WLWCA) near Gueydan, the two Whooping Cranes, along with two other birds from Louisiana, had been in southeast Texas for more than eight months. Part of an experimental reintroduction effort (by LDWF, USFWS, USGS, and the Louisiana Cooperative Fish and Wildlife Research Unit), the deaths of the two-year old male and female Whooping Cranes has reduced the Louisiana group to 44 birds in the wild. Read more about the Louisiana Whoopers here. The deaths of the cranes are being investigated by the U.S. Fish and Wildlife Service and the Texas Parks and Wildlife Department. Whooping Cranes are considered a critically endangered species and protected under the federal Endangered Species and Migratory Bird Treaty Acts, and by Texas and Louisiana state law. Anyone witnessing suspicious activity involving whooping cranes is advised to report that information to LDWF’s Enforcement Division by calling 1-800-442-2511 or using the tip411 program, which may offer a cash reward for information leading to arrests or convictions. To use the tip411 program, citizens can text LADWF and their tip to 847411 or download the “LADWF Tips” iPhone app from the Apple iTunes store free of charge. Citizen Observer, the tip411 provider, uses technology that removes all identifying information before LDWF receives the text so that LDWF cannot identify the sender. Read the LDWF press release here.